This simple apple snack cake, made with fresh apples and applesauce, and topped with a cinnamon brown sugar glaze; is the perfect dessert for a small family dinner or a sweet afternoon treat! So I have a confession to make. I have made this cake four times. This is partly because it is delicious and easy to make, but also I because the first time I attempted to make it was not my best day in the kitchen. I tell you this because we all, whether you are a professional chef, food blogger, or rockin’ home cook; have bad days in this kitchen. Yes, this can be because of a poor recipe, but could also be from missing ingredients or lacking proper equipment, or from various distractions. For me, this first time I attempted this recipe was for Thanksgiving. The days leading up to Thanksgiving were extremely busy for me and we were getting ready to head out of town. This cake seemed like the perfect make ahead Thanksgiving dessert that would travel well. So the night before Thanksgiving, at 11 pm, I went to work on this cake. Late night baking is nothing new for me. I tend to be a night owl and so the late night hours are usually the only time I can squeeze in to get time in the kitchen to do what I love… bake! But that particular day I had been up at 4:30 am and going nonstop until I walked into the kitchen that night. I should have known that things probably would not turn out well. I was exhausted. And even though this cake is pretty easy to whip up, I failed to consider the 40-45 minute bake time. Well I was so tired that night, that I probably pulled the cake out a little too soon and the next morning found the cake a hot mess (and not in a good way). I obviously couldn’t bring a sunken, under cooked cake to Thanksgiving dinner. So a stop at the grocery store Thanksgiving morning was in order. Whomp. Whomp. Whomp. Determined not to give up, I tried making the cake again a few weeks later, when I hadn’t been up since 4 am. And guess what? When baked the full time listed in the recipe, it was a success! Since we enjoyed this cake, when baked properly (LOL! ), I whipped it up again for two different holiday functions. The best thing about this cake, besides being easy to throw together, the measurements are perfect for doubling so if you need a larger cake for a crowd just double it and bake in a 9×13-inch pan. Even though the glaze topping “dresses up” this simple apple snack cake, I prefer to keep this cake “down to earth” and serve it plain. However, if desired vanilla ice cream or homemade whipped cream would also pair beautifully with this fresh, seasonal apple snack cake! 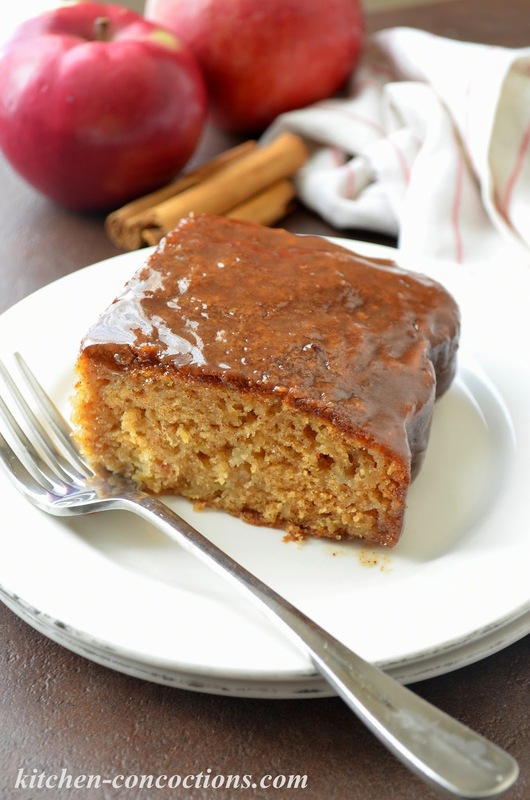 Apple snack cake made with fresh apples and topped with a sticky brown sugar glaze. For the apple cake: Preheat the oven to 350 degrees F. Grease and flour a round or square 8×8-inch pan. Set aside. In a medium bowl, stir together flour, baking soda, salt and cinnamon. Set aside. In a large bowl, whisk together both sugars and eggs until fully incorporated and light in color. Whisk in oil, applesauce and vanilla, whisking until combined. Slowly stir the flour mixture into the egg mixture, stirring until the flour is fully incorporated. Fold the grated apples into the batter. Pour the cake batter into the prepared pan and bake for 40-45 minutes, or until a toothpick inserted in the center comes out clean. Place the hot cake on a wire rack to cool. While cake is still hot, prepare the glaze. For the brown sugar glaze: Combine all the glaze ingredients in a small saucepan. Cook over medium heat, stirring often, until the mixture comes to a gentle boil. Cook for 3 to 5 minutes, or until glaze thickens. Pour hot glaze over the warm cake. Let glazed cake cool completely before serving. NOTE: This recipe was chosen as November’s recipe for the Lick the Bowl Baking Group. However, I got behind in baking and blogging and so I am just now sharing it (stay tuned for December’s recipe)! 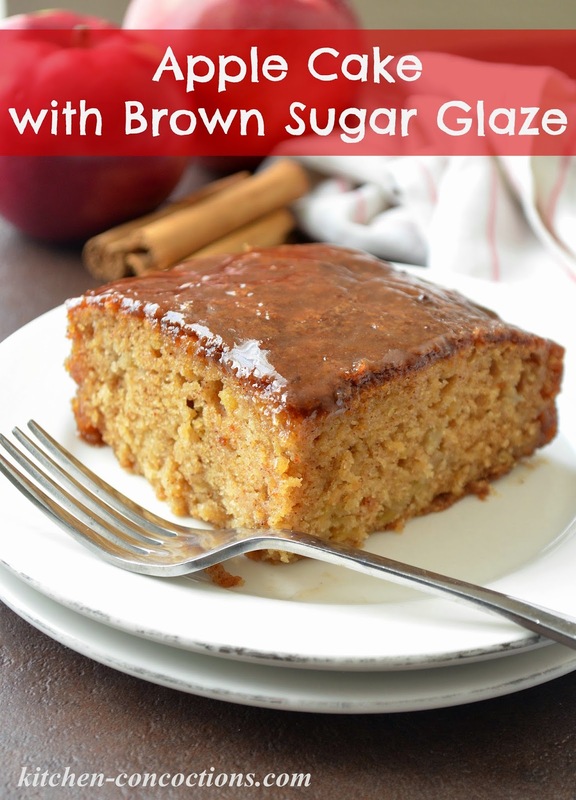 I make Apple Cake but never thought to do a brown sugar glaze!! This is definitely a way to step it up! Thanks for this yummy idea.